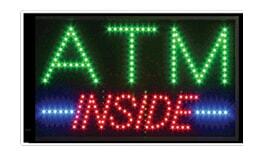 Want to get a lighted LED ATM window sign? We have 11 different styles available. 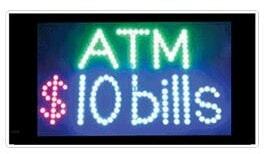 ATM window signs are a great way to attract the attention of both pedestrians and car traffic driving by your business. 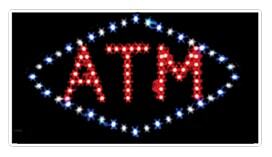 ATM signs have been shown to dramatically increase ATM transaction volume. 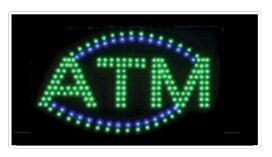 While ATM signs can help increase ATM usage, they can also indirectly increase revenue for your business. Passers by may come into your shop only to use the ATM then while there decide to buy whatever products or services you’re selling. 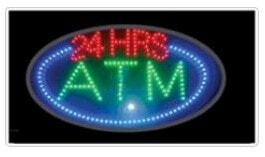 These LED signs look great during evening hours, but can also can be seen perfectly, even in direct sunlight. 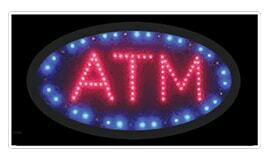 Prineta offers free ATM window signs for any locations that use us as their ATM service provider. 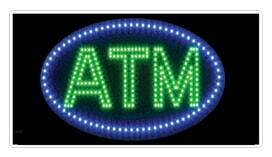 If you’d like to get an ATM window sign, simply contact us through our website contact form! 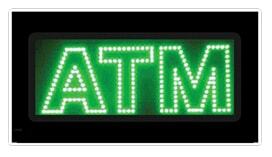 Super slim design: only about 1″ thick. Extra long 13 foot electrical cord. Plug and play: No battery is required. Metal hanging chain is included.